Medovik Tort a.k.a. 15-layer Russian honey cake is the stuff of Russian childhood dreams. Seriously though–I made this once and a Russian bud of mine came over in lightning speed and waxed poetic about the nostalgia this cake inspires in relationship to growing up in Russia. And after eating this delicious, light dessert, I definitely understand why the Medovik Tort // Russian Honey Cake has a special place in the heart of Russians near and far. 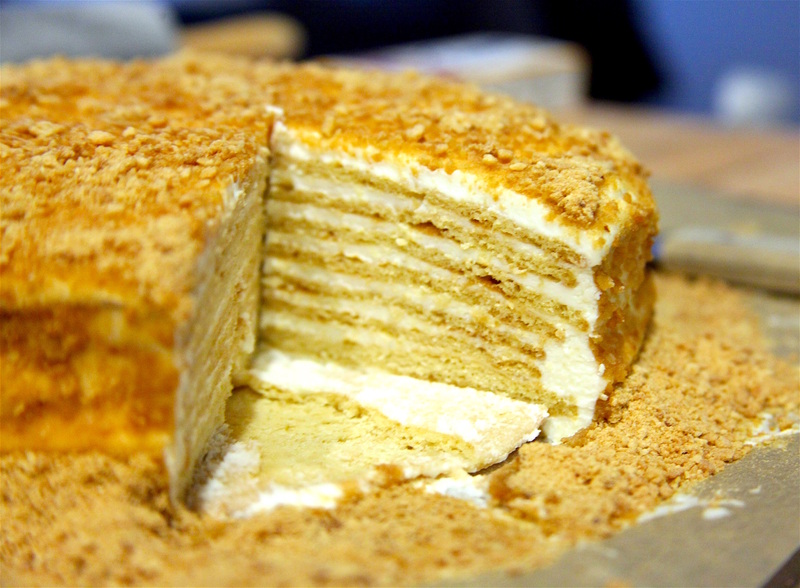 Also referred to as an 8-layer Russian honey cake, the Medovik Tort has a delightfully light honey flavor and employs an incredible unique baking process. In short, the cake is made by making stiff (read: concerningly hard) discs of dough, layering them between ample amounts of sour cream frosting, and then letting the frosting soften the dough overnight in the fridge. Sounds freaky, right? Well, it is but is totally worth it. I’ve had multiple foodies tell me that the Medovik Tort // Russian Honey Cake is their favorite cake in the world. Me IRL. Source: Buzzfeed Tumblr. The process might sound weird, and it’s because it is. Most importantly, it is necessary to make sure there are minimal air pockets in between the layers of Russian honey cake before you set it in the fridge so that your resulting layers are nice and even. As you can see by my pictures below, my cake looked pretty whack until the final stage so the process is extremely forgiving. Might I also recommend you serve this up at your next dinner party and then tell your guests about the weird process after the fact–people always flip their lids when they realize how this one was made. Layering dough discs with honey sour cream. It definitely doesn’t look perfect here but have no fear–the overnight setting is super forgiving. Make this light and delicious Medovik Tort. This 15-layer Russian honey cake is made by setting firm dough discs overnight in layers of honey cream. Prep cake dough. In a medium saucepan on medium heat, melt butter, sugar and honey until fully dissolved. Stir often to avoid burning and remove from heat as soon as dissolved. Off the heat, slowly add in 3 whisked eggs and whisk vigorously until fully incorporated. It is important to slowly add the eggs and aggressively whisk to avoid cooking the eggs. Whisk in baking soda until incorporated. Using a large spatula, fold in 0.5 cups of the unbleached flour at a time. Fully incorporate the mixture before adding each incremental 0.5 cups. Continue until all 3 cups have been incorporated, or until the dough has a dense consistency. Remove dough from mixing bowl and divide into 8 pieces on a floured work surface. Set pieces aside. Flour a work surface and using a rolling pin, roll out 1 piece of dough to form a large, thin circle as best as you can. Once large enough, place a large plate or the bottom of a springform pan on top of the dough and cut out a perfect circle using a knife or pizza cutter. Reserve any excess dough for later–you will use these to make breadcrumbs to top the cake with. Repeat for all remaining pieces of dough. Bake dough. On a large baking sheet covered in parchment paper, place two dough discs and bake in preheated oven until golden (3-5 minutes). Set aside to fully cool. Repeat for all remaining dough discs. 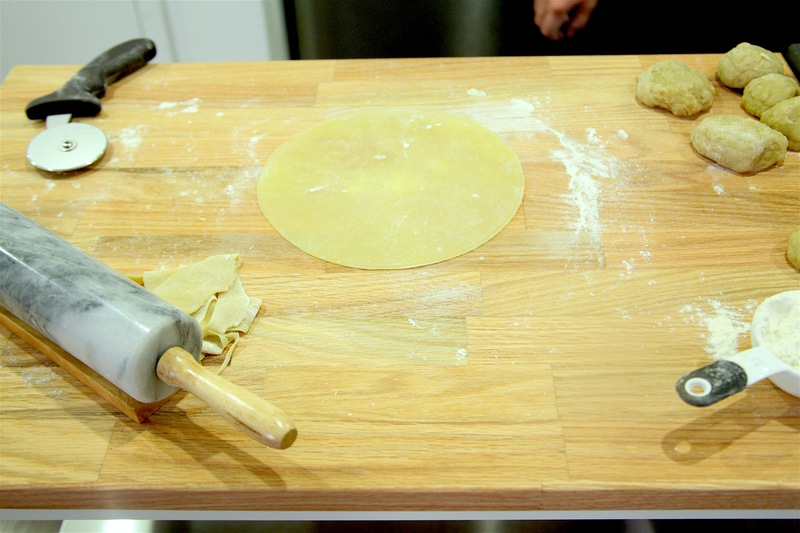 Spread excess dough from Step #6 on a large baking sheet covered in parchment paper until golden (3-5 minutes). Set aside to fully cool. Once cooled, process the firm dough in a food processor to create bread crumbs. Set aside for later use. Make sour cream frosting. Using a stand mixer with the whip attachment, whip heavy cream until stiff peaks form. In a medium mixing bowl, whisk together the sour cream and powdered sugar until fully incorporated. Once mixed thoroughly, slowly fold in the heavy cream stiff peaks until mixture in consistent. Place in refrigerator until ready to use. Assemble cake. Place parchment paper on a large baking sheet or cake tin. 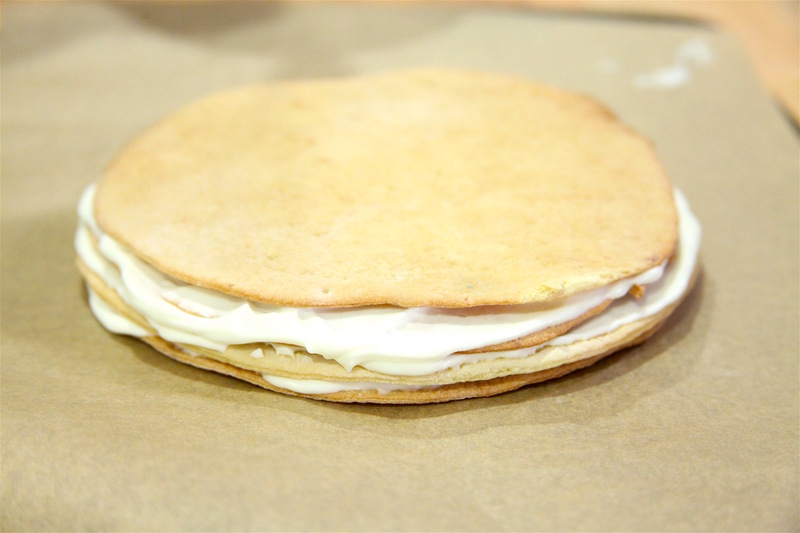 Place one baked dough disc on the parchment paper and top with 1/3 cup of sour cream frosting. Place another dough disc on top of the first layer and lightly press dough disc to release any air, and add another 1/3 cup of sour cream frosting. Repeat for all remaining dough discs and be generous with frosting. Use remaining frosting on the top and sides of the cake. Sprinkle top and sides of cake with breadcrumbs from step #9 to fully cover cake. Wait. Cover cake with plastic wrap or cake tin top and refrigerate 12-36 hours. This gives the cake time to absorb the frosting and soften. Slice and serve with fresh berries of your choice. Made 15-layer Russian honey cake at home? Tag your Medovik tort photos with #PateSmith or share them in the comments for the chance to be featured onsite!